Presenting the 2015 Great Charity Challenge! 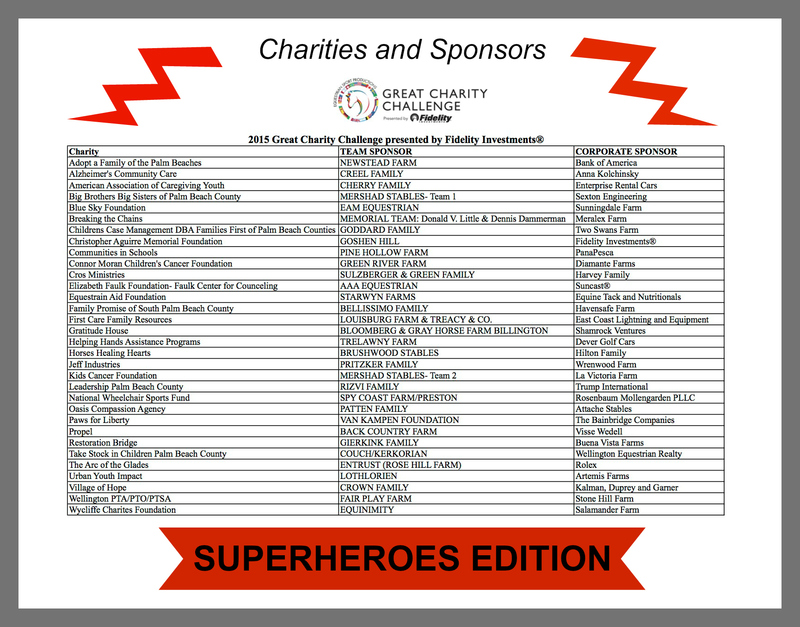 [Wellington, FL] Superheroes are taking front stage at the 2015 Great Charity Challenge presented by Fidelity Investments® (GCC). On Saturday, February 7th, 2015, during the spectacular pro-am relay show jumping competition at the Palm Beach International Equestrian Center in Wellington, Florida, 34 lucky charities will be competing for a share of $1.5 million dollars. The public is in for a treat as this year’s participating riders will be wearing “masks and capes” to help Palm Beach County charities! The GCC, founded in 2010 by Mark and Katherine Bellissimo of Equestrian Sport Productions and their daughter, Paige, has distributed more than $6.2 million from the equestrian community to over 100 nonprofits in Palm Beach County over the last five years. This year, more than 400 local charities applied for a chance to be one of the 34 lucky participants in the running for the top prize of $150,000 with a sliding scale of prize money to the minimum $15,000 amount that every participating charity will win. This year’s event features a family-friendly evening on February 7 which includes many dining options, shopping, a petting zoo, magicians, street performers, face painters, carousel rides, children’s fair, and more. Doors open at 6:00 p.m and the entire competition will be livestreamed online. FREE GENERAL ADMISSION AND FREE OFFSITE PARKING (shuttles to the main grounds provided): 13421 Southshore Blvd. Wellington, FL 33414. For a full list of participating charities, sponsors and additional event information, please visit: www.greatcharitychallenge.com. For more information on Equestrian Sport Productions or the Winter Equestrian Festival, please visit www.PBIEC.com. For ticket inquiries, please contact concert@equestriansport.com.